The Girl Scouts say a Boy Scout rebranding effort is cutting into their turf, causing confusion. 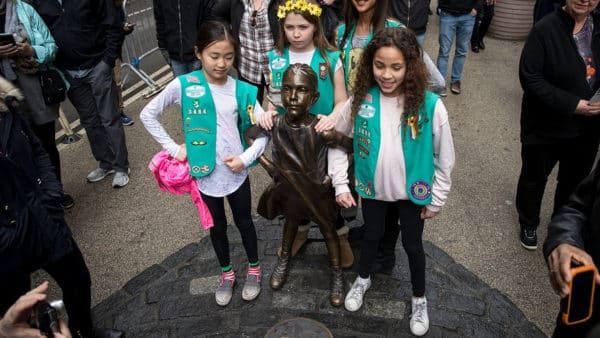 Young members of Girl Scout troop 3484 pose for photos with Wall Street’s ‘Fearless Girl’ statue in New York City. The Girl Scouts have sued the Boy Scouts for trademark infringement. But problems arose when “core gender distinction” was altered by the Boy Scouts of America, which announced in October 2017 it would open its doors to girls beginning in 2019. That all sent the false message that the Boy Scouts of America were now the exclusive organization providing leadership development services to girls, the lawsuit contends. “We applaud every organization that builds character and leadership in children, including the Girl Scouts of the USA, and believe that there is an opportunity for both organizations to serve girls and boys in our communities,” a spokeswoman for Boy Scouts of America told MarketWatch. In court papers, the Girl Scouts said the Boy Scouts’ rebranding announcement has created all kinds of brand confusion across the country. For example, some Minnesota families looking to sign up their girls were erroneously told the Girl Scouts and the Boy Scouts have merged. Meanwhile, in Indiana and South Dakota, some parents mistakenly signed up their daughters to girls’ programs in the Boy Scouts. The lawsuit’s claims include trademark infringement and alleged interference with economic prospects.